← Part III — What about news? Ask most people why newspapers have fallen so far in the last few years, and they’ll say, “The Internet.” And they’ll be right, in a simplistic sort of way. But let’s look closer. What’s really happening is that the lopsided old “mass media” information system — a few providers sending limited amounts of information to huge audiences — is now being engulfed and dwarfed by an information system that is truly “mass” on both ends — sending and receiving. The end of the Mass Media Era and the dawn of the Infinite Media Era. As the Infinite Media Era advances, virtually everyone will be able to produce and distrib ute content at virtually no cost. The geometrically expanding global information system will be able to handle virtually any amount of content. And virtually everyone will be able to access virtually all of it. The cause is a combination of technology and economics. Technology because, over the last 20 years, digital technologies have rapidly multiplied the amount of information that can be moved electronically and multiplied the number and kinds of devices that can access this information. Economics because the costs of both information bandwidth and information devices have spiraled steeply downward. And both trends will continue for the foreseeable future. The cost of moving units of information has fallen from very expensive in the Mass Media Era to nearly zero in the Infinite Media Era. As a direct outcome, in barely 20 years, the barriers of cost and capacity that formed and defined our global information systems have been shattered. The remaining limits are fast disappearing as digital systems gain still more speed and capacity and as digital devices penetrate every economic level and geography. This is a change so profound that most of us, being creatures of the Mass Media Era, barely grasp its implications. Having lived in this restricted system for so long, we barely understand how its limits have determined its contents and the behaviors of its users at both ends of the pipe. And we have only begun to see how infinite bandwidth will drastically alter content and behaviors. Facebook is only a hint of what’s to come. For humanity in total, this is a huge breakthrough. As universal access to information arrives among the populations around the globe, it will unlock vast amounts of previously restricted human potential. Give the world’s people full access to the world’s information, and huge numbers of them will rise to levels of self-actualization that their parents and grandparents could barely imagine. This process will accelerate through the 21st century and beyond. 1. The mass media’s advertising must compete with vast inventories of low-priced space on millions of websites. It’s print dollars vs. digital dimes. As John Paton of Digital First Media has often said, when the print dollars are going away, media companies have to get really good at stacking digital dimes. 2. Mass media content is now just a drop in an infinite ocean. The digital content competition is even stiffer than the advertising competition. Now that people can get virtually any information they want, they’re shifting huge amounts of their media time away from news and other mass-media content into personally relevant information. Generic, one-size-fits-all content like news and mass entertainment, which ruled in the Mass Media Era, is now just a small part of many people’s diet. Where the action is now — for both individuals and web companies — is in what people care about personally. This is why news alone isn’t enough to support much of a local media business model. The top 20 sites in a typical Morris market, ranked by number of visits from local users. 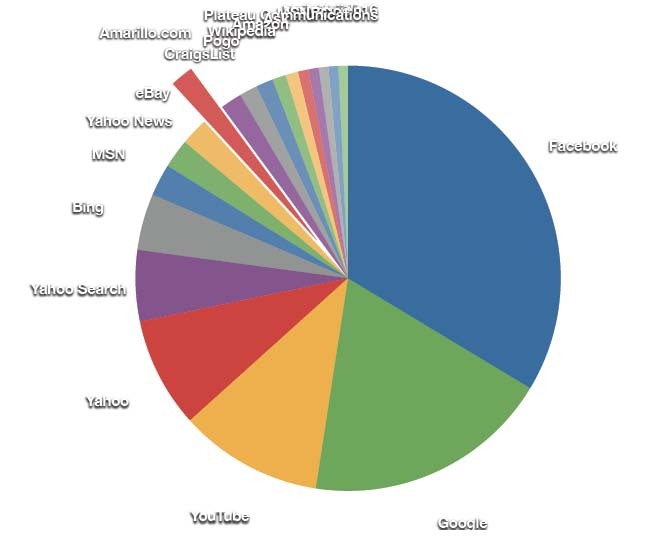 Facebook has more than 20 times as many visits by people in the market as our news site. 3. Digital audiences for local mass media websites are dwarfed by those of national digital players that meet more individualized needs and interests. Most newspaper companies are ignoring this, at their great peril. In the pre-digital era, newspapers dominated the local media landscape, reaching more people every day than any other single media outlet. In the digital age, national/global websites are the giants, reaching far larger local audiences, far more often, than the websites of local media. The 12 Morris Publishing Group daily markets with which I’ve been working are typical. Facebook, Google, Yahoo!, YouTube, Bing, MSN and others dwarf our digital audiences. Facebook is king, getting about 10 percent of all local visits — 20 to 30 times more than Morris news sites. With market shares that small in the digital realm, traditional local media companies are distant also-rans. Comparing ourselves to other local media sites — usually TV and radio — is missing the point; the national/global giants are trouncing us. And they are working harder and harder to sell advertising to local businesses in direct competition with local media. 4. Social media are unlocking an incredibly vast desire and capacity among humans to get and give personally relevant information. When the cost of information falls to near zero, what happens? People start using the pipe to get and give tremendous amounts of information that’s mainly of personal and interpersonal interest. This is the kind of information that matters to the individual and maybe his or her network of friends, but not to many others. The old mass media pipe was too constrained — and therefore too expensive — to handle stuff like, “I guess I’ll go to Starbucks now,” but Facebook is full of it. This appetite for personal and interpersonal information has always been there, but now that it can be fulfilled for free in digital media, it’s being liberated. And it’s huge. As the information pipe goes infinite, this stuff is most of the added volume of content, and it’s being exchanged in an incredible number of small, overlapping personal networks rather than in mass systems. The amount of interpersonal information generated each day is now far greater than what’s created by the old mass-media providers, including newspapers. 5. Digital targeting is providing the tools to reach people across thousands of websites and billions of small networks. For advertisers, the splintered digital media system presents a huge challenge and a huge opportunity. They need to figure out how to reach people who are looking for personally relevant information (often about a purchase) and using dozens of websites and countless tiny personal networks several hours a day. Advertisers see mass-media audiences splintering, and they’re trying to figure out how to target the specific people who might buy their products. It was far easier in “the old days” of the Mass Media Era, when virtually all of the people could be reached through just a few media channels, but there was tremendous waste, because the advertising couldn’t be targeted. 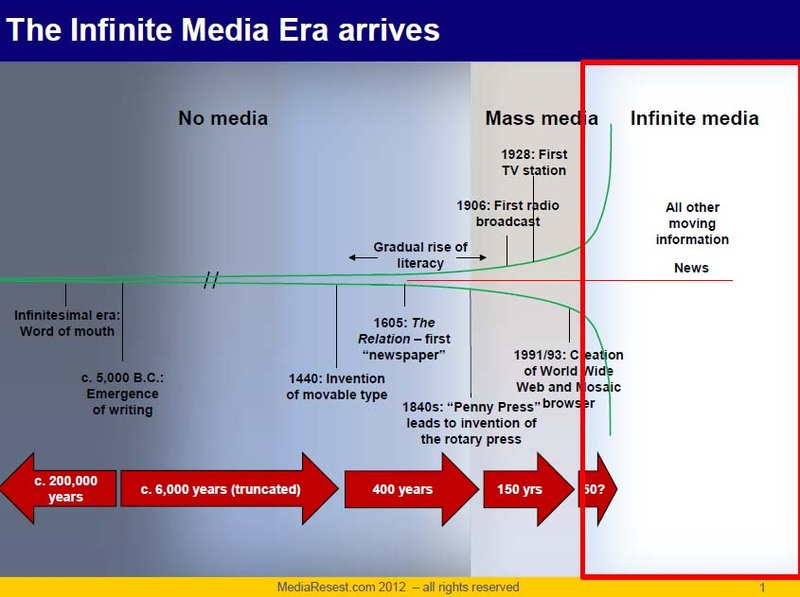 These five factors add up to a massive overall disruption of the mass-media business model. At the heart of it, it’s an audience problem. In the old, information-starved days, we could guarantee market-dominant audiences just by doing news (or, for the broadcast media, entertainment). Today, news won’t get us enough audience to be competitive, and our audiences are too small for digital dimes to make up for the print dollars we’re losing. Radio and television broadcasters may feel a bit smug these days, watching what’s happening to newspaper companies. But it’s just a matter of time before the bandwidth of the “infinite pipe” becomes great enough, and the devices powerful enough, that they will suffer the same problems. It’s the end of the Mass Media Era, and with it, the mass-media business model. Next: Part III — What about news? Posted on April 30, 2012, in Disruption, The basics. Bookmark the permalink. 9 Comments.